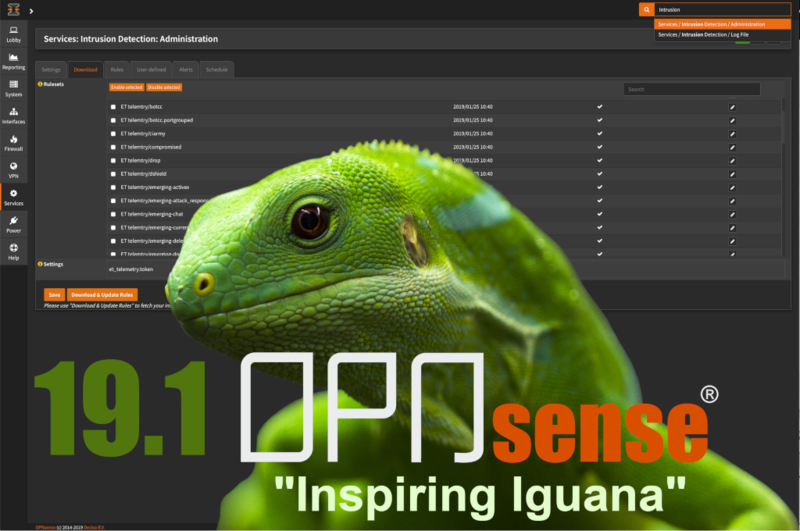 January 31st, 2019 – Middelharnis, The Netherlands – OPNsense 19.1 named ‘Inspiring Iguana’, introduces free access to high quality intrusion detection rules with daily updates. The ruleset is derived from Proofpoint’s ETPRO ruleset and is optimized for Suricata, the IDPS engine, at the heart of OPNsense. Free access is offered by Deciso as an opt-in service in exchange for anonymized telemetry data sharing. With this telemetry data – only shared with Proofpoint – cybersecurity researchers and analysts can improve the detection of malicious network traffic. This unique offer, named ETPRO Telemetry edition, embraces our vision that sharing leads to better products, the core tenet of open source. The Iguana’s sharp eye sight, speed and agility symbolizes OPNsense’s fast pace innovation and its state-of-the-art cyber security protection. OPNsense is an open source, easy-to-use and easy-to-build firewall and routing platform that includes most of the features available in expensive commercial firewalls. It brings the rich feature set of commercial offerings with the benefits of open and verifiable sources. The project is defined by its innovation through modularising and hardening, simple and reliable firmware upgrades, multi-language support, HardenedBSD security, fast adoption of upstream software updates, a friendly community as well as a clear and stable 2-Clause BSD licensing. Deciso is proud to announce the immediate availability of version 19.1 named “Inspiring Iguana”. With version 19.1 OPNsense switches base to HardendedBSD 11.2, the security-enhanced BSD operating system. Users will enjoy the improved user experience, with user interface updates like the collapsible side bar menu and the option to create combined client/server certificates. And, just as with all previous releases, this release comes packed with new features and security updates, either packaged in community plugins such as BIND DNS offering support for blacklists and SafeSearch or as part of the core system like the 2-Factor authentication support for LDAP/Active Directory. Our mission is to make OPNsense the most widely used open source security platform.